Prominent Abstract Expressionist artist Conrad Marca-Relli (1913-2000) is the focus of the significant upcoming exhibition Conrad Marca-Relli: Reconsidered, organized by Hollis Taggart Galleries. This show will feature eighteen works by Marca-Relli spanning from 1949 to 1984, many of which have never been exhibited, as well as a scholarly reconsideration of the work by art historian William Agee. 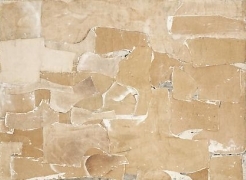 Nearly fifty years ago, Agee recognized Marca-Relli’s elevation of collage to a scale and expressive power on par with the best paintings of the New York School. This exhibition revisits the many facets of Marca-Relli’s collage work, from his explorations of the boundary between figuration and abstraction to his large, all-over abstract compositions, and once again reveals the artist’s innovative contributions to American art. A regular at the Cedar Bar and founding member of the Eighth Street Club, Marca-Relli was an integral part of the downtown scene at midcentury. He participated in the seminal Ninth Street Show in 1951, heralded as the first exhibition to bring together the burgeoning New York School, and helped to organize a sequel exhibition at Eleanor Ward’s Stable Gallery the next year. An important work in the current exhibition, Untitled (1949-1950), is thought to have been included in this 1952 event and clearly demonstrates the artist’s consummate skill as a colorist and his significance as a vital member of the New York School. A key aspect of the current exhibition is the reunion of the work of Marca-Relli and the scholarship of renowned art historian William Agee, curator of the artist’s landmark 1967 retrospective exhibition at the Whitney Museum of American Art. The current catalogue features a full reprint of Agee’s 1967 Whitney catalogue essay, along with a new text in which he is given the rare opportunity to reflect on his original conclusions almost half a century later. With this new text Agee reconsiders Marca-Relli’s work with a more seasoned eye, providing new insights into the artist’s oeuvre that highlight Marca-Relli’s roots in Abstract Expressionism as well as his groundbreaking and highly acclaimed developments in collage. Conrad Marca-Relli: Reconsidered is accompanied by a fully illustrated catalogue with two essays by art historian and curator William C. Agee. Agee is the Evelyn Kranes Kossak Professor of Art History, Emeritus, at Hunter College and has published widely on American art. He has held curatorships at the Museum of Modern Art and the Whitney Museum of American Art, and museum directorships at the Museum of Fine Arts in Houston and the Pasadena Art Museum. His forthcoming book, Modern Art In America 1908-1968, will explore the many artists, movements, histories, and other forces that shaped a critical period in American art.